There are ten videos covering this amazing and iconic road. We have embedded each one in the appropriate section. Using the anchor links supplied below you can quickly jump to any section that you are specifically interested in. Part 1: Orientation & Overview - A Google Earth 3D animation clip ideal for first time drivers of the road to help in orienteering with the road from east to west. There is not much detail in this clip as it is merely an overview. Watch the other 9 videos for detailed information on history, tourism, safety and other information. Part 2: Eastern start to the 6th km - A more detailed look at the first 6 km km with landmarks like the Schotlzkloof waterfall. This video ends just before the first mini pass adjacent to the Wapadsberg. Part 3: From the 6th to the 11th km - We explore the first of the mini-passes (Wapadsberg Pass) and head west through three side ravines, each providing different perspectives of the upper kloof. This video ends at the 11th kilometre at a small neck. Part 4: From 11th to the 20th km - This 9 km long section features Oom Koos se Klip and the second of the small passes - the Kariegasberg Pass. Part 5: From the 20th to the 25th km. This 5 km long section features the trickiest of all the small passes - the Waterkloofrivier Pass, which has some extremely tight hairpins and fabulous scenery. Part 6: From the 25th to the 28th km - This is the shortest section of only 3,5 km, but it's packed with great scenery and includes two small passes - The Kangoberg and Huisrivier passes. The video ends just after the only serious water crossing, where many cars get stuck. Part 7: From the 28th to the 32nd km - This video covers some of the best viewsites along the upper kloof and covers all of the climb out to the summit of the Elands Pass as well as the smaller Botes Nek Pass. Part 8: From the 32nd to the 35th km - This is the highlight of the journey as we take you down the upper half of the awe-inspiring Elands Pass with its multiple hairpins, dizzying drop-offs and narrow width. Part 9: From the 35th to the 37th km - This video deals with the last four hairpins and the final descent down into Die Hel, where we explore some of the accommodation and camping facilities at Cape Nature. Note: By all means watch the videos in any order you like, but if it's your intention to drive this road, we recommend watching them sequentially, to ensure you gain a complete perspective of what to expect. Part 1: Overview and Orientation - Recommended viewing for first time visitors. This video consists entirely of Google Earth animations and is designed to orienteer the first time driver with the size and scope and general layout of the route. Getting there: Drive up the magnificent Thomas Bain built Swartberg Pass from either Prince Albert in the north or via Oudtshoorn in the south. In the middle plateau section of the pass, about halfway between the summit and the Teeberg view site, a narrow gravel road heads off into the west along a long valley. 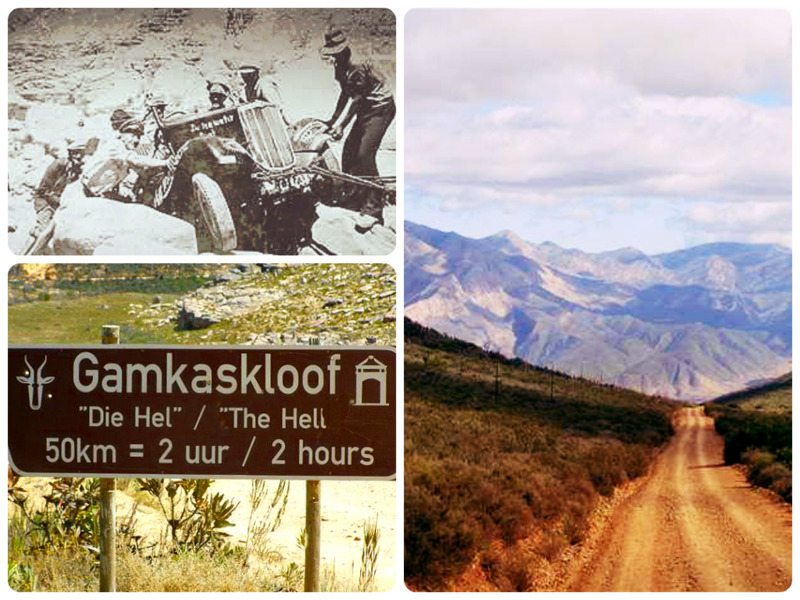 The signboard reads: "GAMKASKLOOF / DIE HEL 37 km = 2 hours"
This is the Swartberg - one of the oldest mountain ranges in the world. Scientists have calculated that it was originally more then 7000m high, but erosion has worn it down to the current height. This drive, together with the Swartberg Pass will provide the finest views of the geology, flora and fauna. This is the eastern start of the Gamkaskloof. The route is a dead end, so allow five hours to complete the journey there and back as the road is sub-standard, slow and convoluted. It is possible to complete the trip in a normal sedan vehicle but a "bakkie" or SUV is a much safer option. This route is not recommended to be driven in a single day. Rushing through here is sacrilege. The Gamka River carves its way through the Swartberg range along the north/south axis several kilometres north of Calitzdorp. Other than the Seweweeks and Meirings Poorts it is the only other ground level poort through the mountains in that region. However, due to the geological complexities of the poort in terms of its almost vertical cliff faces, narrow width, convoluted path and propensity towards frequent flooding, the building of a proper road through it, was deemed not to be feasible. This is truly a long and winding road. It contains 201 bends, curves and corners along that 36,6 km. which averages out at 18 bends per kilometre - and those statistics exclude the 8km flat section along the valley known as Die Hel. The road will climb a total of 1049m and descend 1854m over a series of small and big passes in a general trend from 1441m ASL in the east to 570m ASL at the bottom of the Elands Pass. It is normal for drivers to become fatigued on this road and motorcycle riders usually end up exhausted - such is the concentration level required. Accidents happen when drivers become tired. We recommend stopping regularly along this road for a leg stretch, take some photos or just marvel at the serenity and breathe in the clean mountain air. There are no shortage of beautiful places to take a rest. More importantly, we suggest spending at least one night at Die Hel and more if you have the time. To drive or ride this road out and back in a single day is not sensible and will greatly detract from its many attractions. Part 2: The Start from the Swartberg Pass plateau to the 6th kilometre. Part 2 of this multi-part series on the Gamkaskloof covers the first 6 km from the eastern start off the Swartberg Pass to the first mini-pass at the 6 km point. If you have the luxury of picking a perfect time to drive this route, springtime is undoubtedly the best. The mountain fynbos and proteas will be in bloom and the streams and waterfalls will be on full display. At the start area you can enjoy a full 360 degree panoramic view of the ancient Swartberg mountains. Within a hundred metres you will see a stone obelisk on the left hand side of the road. The inscription (translated from Afrikaans) reads: 'Otto du Plessis Road – unveiled by the Administrator Mr. N.J.Malan on the 9th August 1962'. 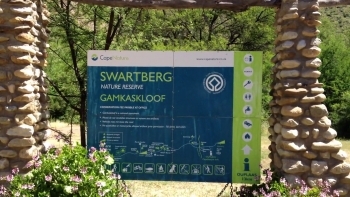 Amongst several signboards near the start, there is one informing you that you are entering a protected area – namely the Swartberg Nature Reserve, and that you need to familiarise yourself with the rules and regulations pertaining to the reserve. Besides the obvious rules around littering, noise, not removing any plants or other material, perhaps the most important rule is that no fires are allowed. Mountain fires can have devastating consequences to the whole region, so please never break this rule. The first three kms are easy going as the road heads westwards over the valley floor. You will have time to enjoy the mountain scenery on both sides of the road. Up ahead at the 11 o clock position a prominent peak can be identified. This is the 2003m high Waboomsberg. 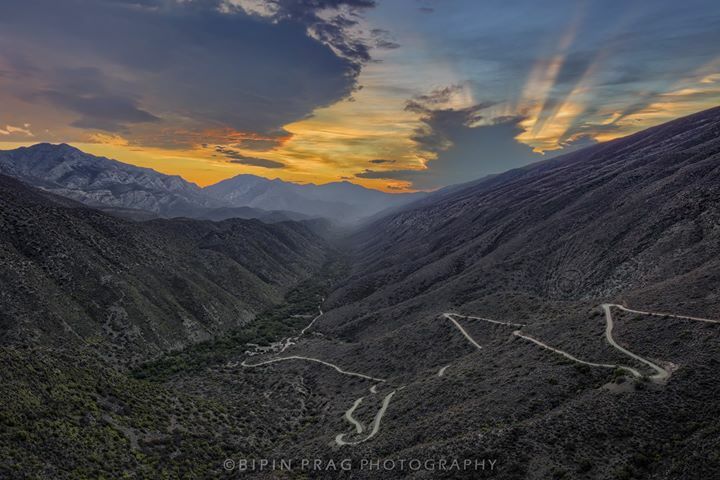 The road faithfully follows the valley formed by two towering east-west running ridges of the Swartberg range. This valley ranges between 4 km wide at its eastern end to under 1 km at its western end. The road is relatively modern in that it was built in 1962 by a small band of roadworkers and a foreman (Koos van Zyl) in a bulldozer. About 1,7 km from the start, the road dips down through a left hand bend, where a short waterfall plunges down the mountainside on the left hand side of the road. This is the headwaters and source of the Scholtzkloof river. In rainy periods it's easy to spot the waterfall from the left hand side of the road at a higher elevation than the road. The stream passes under the road at the apex of this first big bend. The next section is easy as the road heads directly into the west and begins climbing steadily towards the summit, which is reached at the 4.9 km point at an altitude of 1443m ASL. The gradients on this climb vary between 1:20 and 1:14. At the time of filming in June 2017 the Swartberg had been subjected to a severe flash flood just 2 months earlier which resulted in the closure of the Swartberg pass at its northern end between Malvadraai and Eerstewater. The floods did less damage to the Gamkaskloof Road, but nonetheless the road surface deteriorated somewhat. The road is normally in a better condition as shown on this video footage. Remember that the driving always appears easier on video than what it is in reality. The climb up to the summit is stony and non 4WD vehicles might experience loss of traction and control along this section. If you have not deflated your tyres, do so at this point, as it makes a huge difference to the tyre grip on the road and has the additional benefits of providing a more comfortable ride as well as reducing the risk of punctures. When oncoming traffic approaches, it is etiquette to give way to the ascending vehicle. The road width is not too narrow along this particular section, but it is still necessary to slow down and pull over as far left as possible. Once over the summit point, the heading remains straight into the west and a long descent of 1.1 km commences, which takes the road down to the first of the 11 passes you will be traversing. None of these smaller passes are named, but for the sake of indexing, we will refer to this first little pass as the Waboomsberg Pass as the peak is directly to the left of the pass. In springtime, the slopes are bedecked in yellow flowers with the odd protea bush (or Waboom) adding a splash of pink. Part 3 of this series on the Gamkaskloof road, covers the section from the 6th to the 11th kilometre and is mainly a gentle descent that curves in and out of three transverse ravines. This section starts at the top of the first small pass of eleven passes along this road, which we have allocated the name of Waboomsberg Pass for the purpose of indexing and orientation, as it is located exactly north of the dominant peak of the same name. The road drops down steadily through a slack S-curve, then curls through a 170 degree left hand hairpin bend at the 6,1 km mark. This followed very quickly by another big right hand bend, but the turn rate is easier. The road gradually reverts back into a south-westerly heading, then drops down into the first ravine at the 6,9 km point. You’ll only find the water flowing here after good rains, but the dense growth of restios and other water hungry plants is a sure sign that water flows here regularly. A short climb follows and the road soon levels off and starts descending once more down a straight section into the SSW which lasts for 900m. You are to all intents and purposes on your own here and you need to be self sufficient. Traffic volumes are very low during the week, where you will be lucky to see one other vehicle, but over weekend that number might quadruple. There is no mobile reception whatsoever, so check the condition of your spare wheel and tools before departure. If you look up to your left at 11 o clock a very tall peak dominates the skyline for the next few kilometres. This is the Kariegasberg with a summit height of 2053m. The next section consists of another slack S-curve as the road swings sharply to the left and skirts the second transverse ravine. Here there is often crystal clear flowing water, which sometimes runs over the roadway, but it seldom causes any issues in terms of getting over it. The views to the north are spectacular and this ravine also marks the western boundary of the original farm, named Paarde Vley, spelt in the old Dutch way,. The road swings out of the ravine, once more resuming it’s westerly heading. The descent continues via a gentle S-curve and enters the third side ravine at the 10 km mark. 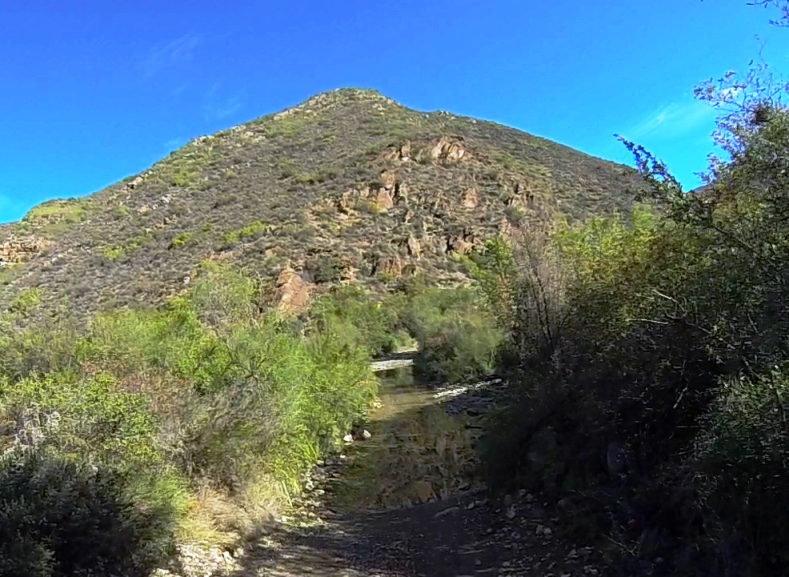 This is the sharpest corner set of the three ravines on this section and you will need to bring your speed right down to 10 km per hour as the road crosses the third stream via a very sharp right hand bend of 110 degrees through thick restios and bushes. A short way down the ravine, there is a wonderful rock pool for cooling off on those hot summer days. The road begins another short climb via a double S-bend, where this video ends at the 11km mark. If you look a little further ahead at the 11 o clock position, the Kangoberg can be seen. This peak is slightly lower in height at 1853m and holds sentinel over this section of the road. Most of the next 9 km is in the descending mode and a total of 440m of latitude will be lost as progress is wade into the west. This section of the road traverses the two original farms of Kliphuis Vley 197 and Groot Vley 198. The road remains on the southern side of the valley floor and the going is fairly easy, but take note of the large amount of big rocks that have rolled down from the mountain side – some of these are as big as motor vehicles. The valley widens substantially at the 12 km mark and soon enters a 90 degree right hand initiated S bend at the 13 km mark. At the 14,7 km point, a short tight S-bend takes the road through a small side ravine, then very quickly enters a second side ravine via a sharp right hand bend. As the road exits this ravine, at the apex of the left hand exit curve, there is a very large rock right next to the road. This is signposted as Oom Koos se Klip. During the construction of the road, this chunk of rock proved too formidable an obstacle for the big bulldozer, controlled by the larger than life character of Koos van Zyl, the foreman in charge of the road construction at the time. Not one to give up on a challenge, the rock proved to be the bulldozer’s nemesis and refused to budge. The road had to be slightly modified from the engineers lines, by skirting the rock on its southern side. The road dips through another side stream at the 15,4 km mark, then continues westward remaining fairly straight for 1 km. At the 16,5 km point, the road swings through a wide left hand curve into a big side ravine, which signals the start of the second small pass, which we have labelled as the Kangoberg Pass. The kloof narrows again at this point, as the road swings away into the south. One gets a perfect view of the Kangoberg from this vantage point, as the road bends consistently to the left until the heading is south-east. This little pass is very attractive with some built up retaining walls which prop the road up as it heads towards the stream forming the ravine from the south. The final bend is a very sharp right hand hairpin of 160 degrees and the small concrete single width bridge is crossed. If you need to fill water bottles or just take a breather, this is a great spot with some parking on the far side of the bridge. This stream has potable water in it at most times of the year. The road bends back into the west as the side ravine is exited via a gentle S curve and continues descending to a second stream crossing at the 19,6 km point, where this video ends. Due to the high levels of concentration required on this road, it is common for drivers to become fatigued. In the case of motorcyclists, even more so. It is recommended to take several short breaks along this road, stopping at least every 30 minutes. 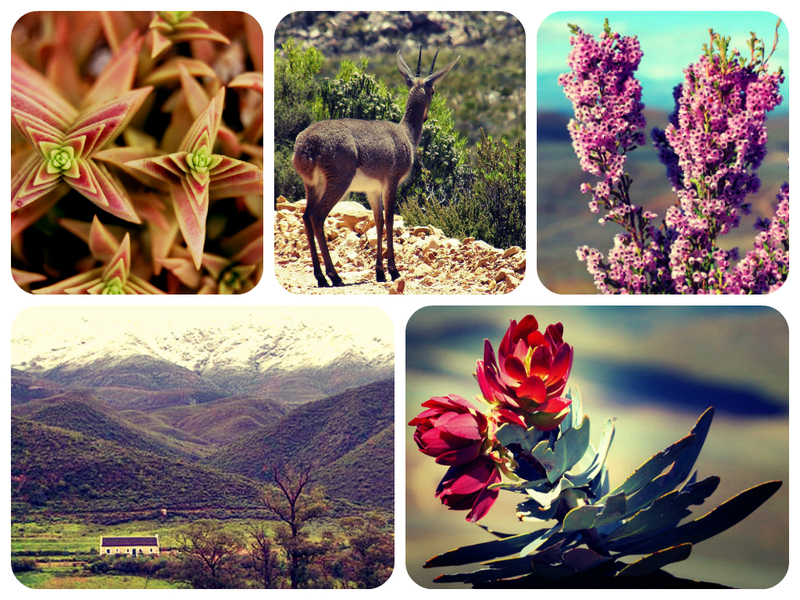 There are literally thousands of photo opportunities and if you only intend visiting here once in your lifetime, relax, take lots of photos and soak in the sublime grandeur of the Swartberg. This section features the third mini pass which we have named Waterkloofrivier Pass. All of this section falls within the boundaries of the original farm named Doorn Kloof 199. The 5 km is quite undulating and includes three fairly steep climbs, but none of them are longer than a few hundred metres. The final climb out of the Waterrivierkloof Pass is very steep and reaches 1:5. Things get very slippery on this climb in wet weather, so be aware that if you’re not in a 4WD vehicle, that you might experience traction issues here. From the start at the 20 km mark, the road dips quickly to clear a small side ravine via a sharp left hand initiated 90 degree bend. The road climbs again into the north-west for 700m to clear another mini summit at a small neck. This scenario repeats itself several times along the route and for cyclists that are tired, the view of the road winding its way up to another neck is quite dispiriting. From the neck at the 22,4 km mark, there are great views into the west, where the road can be seen zig-zagging its way up the next slope. From the neck, the road changes direction into the WSW and commences a descent a steep descent of 700m. At the 23 km point, there’s another left hand bend which leads into a river crossing, where there is often water during the rainy season. This crossing is unlikely to present any problems (even to non 4WD vehicles) as it has a firm, stony bed and is only about 6m wide. This marks the start of the third mini-pass – the Waterkloofrivier Pass which is probably the trickiest of all the small passes on this road. Beware of this corner as it gets ever sharper, rotating through almost 160 degrees, as the ravine is cleared and heads north for a short distance. At the 23,4 km mark there is an extremely sharp hairpin bend, which also climbs very steeply. It’s best to change to first gear before you get to the hairpin and remain in 1st gear until you reach the summit of this tricky little pass. Once through the left hand hairpin, the direction reverses itself by 180 degrees and the road you have just been on and can be seen directly below on your left. Up ahead there are great views of the descent into the ravine, but it’s both awkward and dangerous to stop here for a photograph. The road climbs steadily for 200m, where the next hairpin is encountered. Be very careful of this corner (and more so on your return journey when you will be descending) as the turning rate is extremely tight, plus the gradient kicks up to 1:5 right at the corner. This is the reason why you should remain in 1st gear from the previous hairpin. Keep a bit of momentum going and engine revs above 2000 rpm as you enter this corner. Should you be in a front wheel drive vehicle, and the front wheels start spinning, stop immediately. Under no circumstances should you accelerate harder as it will only make the spinning worse. Rather reverse back down carefully to a more level area and start again, using a different line and engine power/speed combination. If you still experience traction issues, deflate your tyres some more. You can safely go down as low as 1 bar. This will improve traction as the tyre footprint increases with deflation and more often than not, gets one out of trouble. A short climb out into the north-west follows, where you will reach yet another neck, offering those classic Gamkaskloof vistas of a solitary gravel road carved out of the mountainside, stretching away in countless switchbacks as far as the eye can see. A fairly steep descent follows which lasts for 1 km. This video ends just before the start of the next mini-pass, which is the Doornkloof pass and also contains the deepest and longest water crossing, which has been the undoing of many non 4WD vehicles over the years. This video includes two small passes, namely the Doornkloof and Botes Nek Passes. This section of the road traverses two farms - Doornkloof and Waterkloof. From the 25th kilometre the road swings through a big left hand bend into the south as it drops down into a side ravine. After 100m at the 25,1 km mark, the road enters an extremely sharp right hand hairpin. The views to the left over the valley are stunning and you will be able to trace the road disappearing up and over the next hill from this vantage point. With the heading having changed into the north for 300m, the next hairpin bend has to be negotiated, which is an equally sharp left hander. This brings the heading once again into the south, as the road drops down to the river crossing via a wide right hand bend. Make a note of the position of this river crossing, which occurs at the 25,6 km point. This is easily the most difficult river crossing on the entire route and we advise to check the depth before proceeding – especially if you are not in a 4WD vehicle. This stream drains a large section of the southern Swartberg and can carry plenty of water after rain. This crossing is troublesome for two reasons. Firstly the bottom consists of thousands of loose, fist sized stones which will definitely reduce traction and secondly the depth can vary from 100mm to 600mm. Many vehicles have got stuck here over the years, so before you plunge into the stream at speed, first do the walk test. Take a stick and walk along both proposed tracks checking for obstacles and holes. This will give you a clear understanding of whether your vehicle will make it over this crossing or not. You should also look up your vehicle’s wading depth in the handbook and if the water level is deeper, than the wading depth, you stand an almost 100% chance of getting stuck with a flooded engine or water logged electrics. Rather wait until a 4x4 shows up and ask them to tow you across. On the day of filming the water levels were normal at around 250mm depth. Once over the stream, the road climbs out of the ravine into the north-east towards the next small neck. At the 26,5 km point, you will get a wonderful view to your right of the spectacular Waterkloof canyon. If you get to this point early enough in the morning, you will have the sun backlighting the gorge, producing a marvellous photographic composition. This massive gorge has been carved out by the Huisrivier and forms a confluence with the Gamkarivier a few kilometres further north. The canyon has no access either by road or footpath. It is at this point that the Klipspringers are often spotted – sometimes remaining completely stationary in the middle of the road, almost as if posing for photographs. These petite animals are well adapted to life on these steep mountain slopes and appear to have no fear of motor vehicles or humans. The road now begins undulating via a series of easy bends towards the next side ravine via a sharp right hand bend of 90 degrees at the 27 km point. This marks the start of the fourth pass, which is the Huisrivier Pass. Whilst it’s not as technically difficult as the previous one, it has some steep, unguarded drop offs and a single, sharp right hand bend of 170 degrees. The scenery is exceptionally beautiful along this section. Once through this side ravine, the road begins climbing again towards the next neck, which is reached at the 28,5 km point. There is ample parking space at this neck, and you will have photo opportunities both to the west and to the east from this point. This section of the Gamkaskloof, despite being only 3,5 km in length is exceptionally scenic and is a delight to the adventure traveller. Take it nice and slowly through here and savour every moment. There now remains a long and winding climb of 5 km up to the summit of the Elands Pass. The big climb up to the start of the Elands Pass is 4 km long and climbs 333 vertical metres, Making this section easily the biggest ascent along the entire road when driven east to west. This is also the final section ahead of the highlight of the trip, which is of course, the descent down the Elands Pass into the lush valley, known as Die Hel. The video starts at the final river crossing at the 28th km mark. This stream flows down the Swartberg from the north western side and has a substantial drainage area, but the actual crossing will seldom present any problems to the average driver. It marks the start of the penultimate pass of the route and for the purpose of indexing we have named this pass Botes Nek Pass, as it starts very close to the northern border of the original farm of the same name. Immediately after the crossing the road swings sharply to the right through 160 degrees heading briefly into the north-east as the road begins climbing for a solid 4 km without a break. It soon kinks to the left assuming a more northerly heading for 800m, then reaches a very sharp left hand bend of 150 degrees. At the apex of this bend, there is a small level area, big enough for a few vehicles. This is a wonderful spot to take photographs and you might be overwhelmed with the size and scope of the scenery on offer. To the east, there are perfect views of the road zig-zagging its way down into the ravine that you have just driven and to the west, the road can be seen winding its way over neck after neck to the summit point which can’t be seen from this point. Another reason to take a good break here, is that within 3 km, you will be arriving at the summit of the Elands Pass and you will need to be focussed for the big descent down to Die Hel. The road heads briefly into the south-west, then begins a long climb to the next neck, via a wide and gentle right hand curve. This climb last for 1km, where a double hairpin bend is reached at the 29,6 km mark. If you still have an appetite for photography, this neck also makes an excellent vantage point, or just take another leg-stretch and marvel at the sheer grandeur of the Swartberg, which towers up on both sides of the road, displaying so many shades of natural colour from soft grays near the top, past much darker, almost black sections in the middle, then dropping down into the bush covered slopes closer to the road. The dominant canyon to the north-east is the Waterkloof, which dominates the northern view for many kilometres. At the 29,8 km point, the road swings to the left through a small side ravine, maintaining its climb rate, then resumes a westerly heading. Once through this side ravine, most of the bends are fairly easy, but the condition of the road surface, forces a slow speed. The climb gradient along most of this ascent ranges between 1:5 and 1:7 and most of the driving, will by necessity be done in 2nd gear (depending on engine size). Small antelope like grey rhebuck and klipsringer are frequently seen along this section, so keep a sharp eye out for them, as they seem to favour sleeping or resting in the middle of the road. The final 500m leading up the summit, sees the road arrow straight into the west as the summit gradually makes an appearance. The views here are not as dramatic as one would expect after such a long and steep climb, but the real drama and stunning scenery lies just 2 km further down the long straight descent ahead of your view. Part 8 of this video series on the Gamkaskloof covers the upper section of the Elands Pass and is without question the most amazing part of this journey. The Elands Pass is on many people’s bucket list for it’s magnificent views, multiple hairpins, narrow width and steep, unguarded drop-offs. If you have any passengers suffering from acrophobia/vertigo, arrange that they can sit on the side of the vehicle furthest away from the drop-offs. You will need to move them after each switchback. From the start at the 32 km mark, the summit point is reached at 1048m ASL. The summit itself is something of an anti-climax after the 4 km ascent up the eastern side from Botes Nek, but sit back and relax for the next 1,2 km as the road drops down towards the main kloof at a gradient of 1:14. As altitude is lost, one gets the first glimpses of Die Hel as a tiny wisp of greenery very far below in the valley. This section of the descent is probably the easiest of the entire Gamkaskloof road, as it has no bends and the surface is usually quite good, allowing a faster speed to be maintained. When you get to the 33,5 km mark, the road drops down into a tight S bend to the left. You need to drop your speed right down to 20 kph for this bend. As the S-curve is exited via the second left hand bend, you will get an amazing view of Die Hel. The road can be seen dropping down to the miniature looking buildings in the valley, via multiple switchbacks. It is a breathtaking sight. There’s nowhere to stop, but due to the low traffic volumes, no-one will mind if you block the road for a few minutes. The views stretch away into the west where the entire valley is visible well past the Gamkapoort. Now gear down to 2nd or even 1st gear and allow your engine compression to slow your vehicle down as you begin the first switchback which is into the south. The road is very narrow and it’s impossible to get past another vehicle. Make a careful mental note of the few places where there are spots just wide enough for two cars to pass each other. Should you encounter a vehicle ascending the pass, one of you will have reverse back to a suitable place. It is etiquette to allow the ascending vehicle right of way, but this is not always practical. If you are the vehicle that is reversing, be extremely careful and take your time, as one small mistake here could end in disaster. Remember that at each of the hairpin bends the road is quite wide and these often make for the safest places to allow passing. When you are at the first viewpoint, described earlier, you will be able to see most of the pass and any vehicle climbing up towards you will be easily spotted. It takes about 15 minutes to drive the pass, so it might be prudent to sit tight at a wide section and wait for the ascending vehicle to get past you safely. The further south you drop on the first leg, the better the views become. This section has 12 bends along its length, but none of them are very sharp. The driver needs to concentrate 100% on the road and not allow the views to be too distracting. Just before the first hairpin bend, there is a short concrete stripped section. This is probably the best angle to take a photograph of the pass. The first hairpin appears at the 34,3 km mark and bigger SUV’s and double can bakkies will need to go into full lock to make it through the turn. Take it very slowly, just in case your vehicle can’t make the turn. Don’t take any risks and rather do a 3 point turn to safely negotiate this bend if in any doubt. Your views are now on the left hand side, allowing your passengers to see Die Hel in all its grandeur. With the heading now into the north and the roadway that you have just descended being directly above you, the road follows the contours of the mountainside. A section is passed where there are wired cages of packed rock stacked on the right hand side, which helps prevent landslides over the roadway. The scree can be seen all the way up the next level of the road and has obviously caused problems in the past. This section is once again extremely narrow, so stay focused. There are 10 bends to negotiate, but due to the low speed you will be travelling, none of them should present any problems. There are two concreted sections provided to improve traction and to protect the road surface from water damage. At the 34.7 km point, the road enters a side ravine, where a very tight left hand bend of 110 degrees has to be negotiated. There is a narrow concreted drift through the stream with the drop side marked by three unusually tall chevron boards. The dip and exit after this little bridge is steep and you will have a brief period where you will not be able to see the road. Just drive slowly and keep your steering straight ahead. The road now curves around the contour of the mountain for the next 400m heading into the WSW. This section has 5 gentle bends with the views remaining on the left hand side. There are hundreds of magnificent tall aloes on both sides of the road and if the light is just right, this makes for a wonderful photo composition. 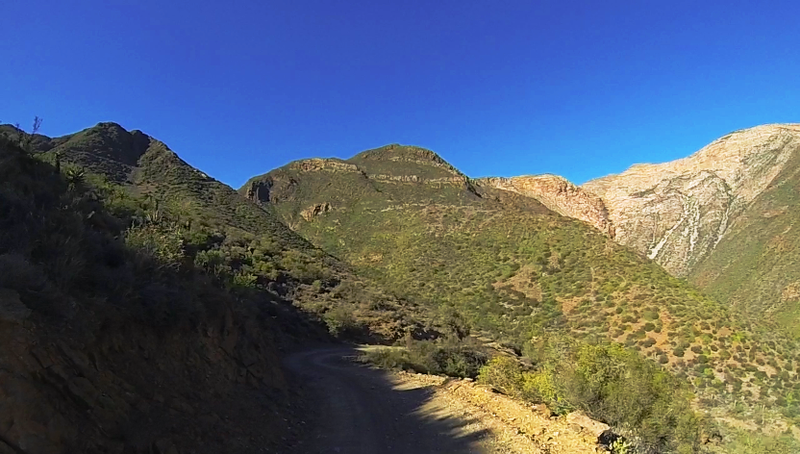 Part 9 of this video series on the Gamkaskloof covers the last two kilometres down the Elands Pass which includes 4 extreme hairpin bends and ends at the entrance gate at the campsite at Die Hel, managed by the Swartberg Nature Reserve. Despite this short section being just 2 kms long, you will descend 137 vertical metres which converts into an average descent gradient of 1:14 but there are many sections along this final drop which are as steep as 1:7. Whilst 1:7 is steep, the Elands Pass is actually designed along a fairly easy gradient and it is not the steepeness which puts the fear of God into some drivers, but rather the narrow width, multiple hairpins and sheer and unguarded drops-offs which do the trick. The second of the five hairpins makes its appearance at the 35,2 km mark. This hairpin is concreted, so if you are in a 4WD drive vehicle, you will need to disengage the centre diff, otherwise the vehicle will experience axle wind-up, which is not good for the differentials, but remember to re-engage it once you are through the bend. The second hairpin is very tight, probably using full lock by longer vehicles. Once through the hairpin, the direction changes into the ESE for the next 100m as the road drops down towards the third hairpin. 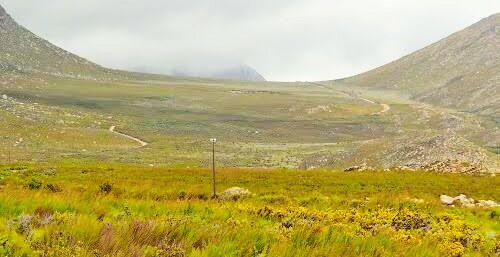 This part of the Elands Pass descends for most of its length down a long ridge which is formed by two kloofs. The more easterly kloof is formed by the stream that you crossed earlier via the concrete drift and the three tall chevron boards, whilst the more westerly kloof, is known as Lemoenkloof. The third hairpin (which is a right hander) has a slightly wider radius and is gravel surfaced, but still requires a low speed of around 10 kph, to prevent a wheel going over the edge. It makes its appearance at the 35,3 km mark and once safely through this hairpin, the heading settles back into the WSW for the next 400m, descending consistently. From this point, the drop-offs gradually become less severe and the buildings in the valley start taking on a less toy-like appearance, as altitude is lost. The fourth hairpin is at the 35,7 km point and bends to the left again. As in the previous left handed hairpin, this takes the direction back into the ESE for the last time. This leg lasts for 400m and the road can be seen at a lower level, a sure indicator that you have almost reached the bottom of the pass. The fifth and final hairpin is reached at the 36,1 km mark and is the easiest of the five in terms of turning circle. With the terrain having substantially levelled off, the last 700m of the pass is relatively easy. The vegetation becomes denser as more trees appear amongst the thousands of aloes. A few sign-boards are passed as the road loses the last bit of altitude via an easy S-bend. The road plunges into thicker bush and suddenly after clearing a small dip, the stone entrance gates of rest camp at Die Hel appear directly ahead. A small dun coloured traditional farm-house is located right next to the road, which is one of several cottages in the kloof, which have been carefully restored. Nearly all the cottages run on solar power and gas and all have fire places for those chilly winter nights. The game ranger’s house is off to the left, should you require assistance with anything. It is important to book accommodation and camp sites in advance through Cape Nature. The campsites are attractively laid out in the riverine bush and provide good shade and spotless ablutions. All of the cottages and campsites are named after the original klowers. This is only the start of the valley. There are more accommodation options further to the west with the likes of Fonteinplaas after another 5,5 km and the last farm in the west also offering cottages is known as Boplaas, which is 8km further west after crossing the Gamka River. Part 10 and the final video on the Gamkaskloof covers the 6 km section from the Cape Nature campsites to Fonteinplaas guest farm. Most of this section of Die Hel is through dense riverine bush and includes several crossings of the river via stony drifts are low level concrete bridges. The vegetation is surprisingly lush, considering this is officially part of the Klein Karoo, but over the last 200 years, this valley has always enjoyed the benefit of penennial water. Keep a sharp lookout for animals on the road and down at this lower altitude, the presence of baboons is almost guaranteed. But the biggest danger is driving into a kudu. These large and sturdy antelope are notorious for jumping in front of vehicles at the last possible moment and your filming team have been the victims of hitting a fully grown kudu in Namibia, where we were lucky to have escaped serious injury. 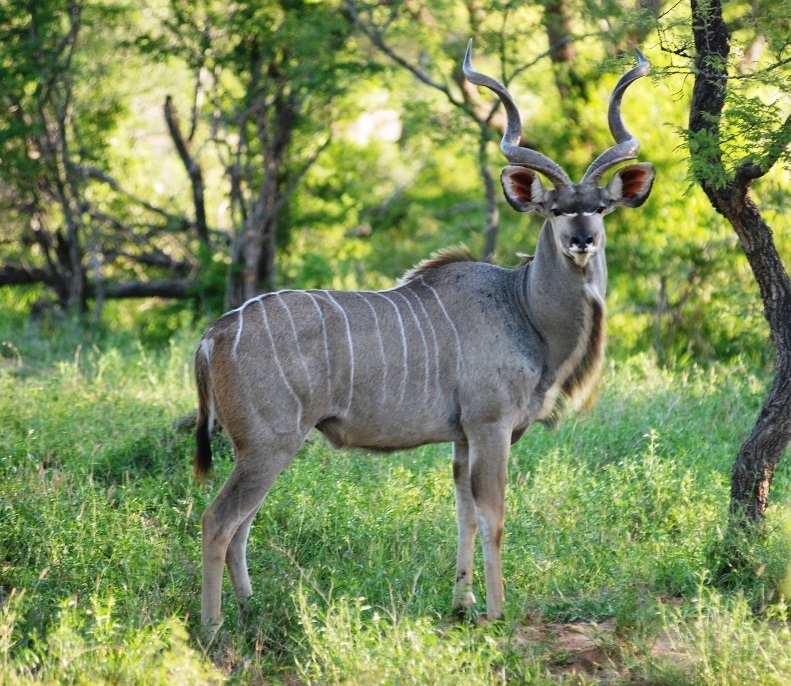 Kudu are almost impossible to spot with their camouflage colours in the thick bush and at night its common to hear them stomping around the campsites. 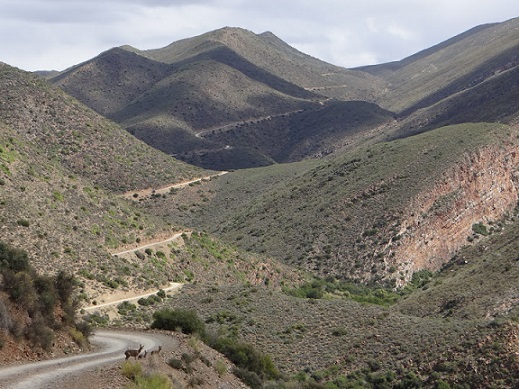 The southern ridges of Swartberg are split by several deep kloofs. As you drive westwards, these will be on your left and include Grootkloof, followed logically by Kleinkloof, then Tierkloof, Pampoenkloof and then the major kloof, which is of course the Gamkapoort. After 5,5 km from the entrance gates to Die Hel, there are two intersections. Keep right in both cases and suddenly the buildings at the Fonteinplaas guest farm pop into view. This is owned by Annatjie Joubert (nee Mostert) who returned to Die Hel to the family farm and set up a shop, restaurant, guest cottages, caravan park and campsites. Here they are in the process of making Honeybush tea, which you can sample at the restaurant. The main building, which is under thatch was built using Olienhout, which is quaintly crooked, but incredibly hard wood. In the shop you can purchase a wide range of homemade jams, pickles, preserves and other delicious farm-fresh produce and the organic eggs have the yellowest yolks – compared to what one normally buys at a supermarket. 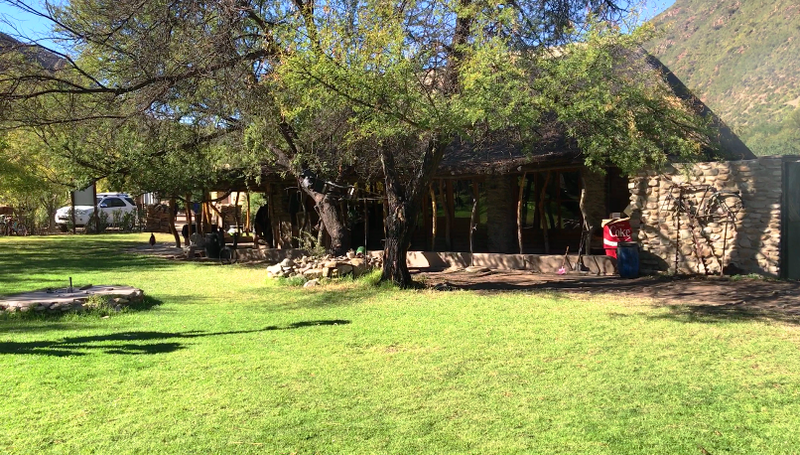 The hospitality at Fonteinplaas is legendary where you can enjoy home cooked meals at the restaurant or have it delivered to your cottage or campsite. The property is surrounded by an eclectic collection of very old cars, a moped dating back to the 1960’s, a vineyard, a succulent garden and a red Border Collie called Koejawel that plays a never ending stalking game with a rescued rooster – one of Annatjie Joubert’s many pets. Annatjie is the last of the true klovers, who chose not to sell the family farm and return to the kloof to set up facilities you see today.Take the time to chat to Annatjie who will recall her early life in Die Hel and straighten the facts of the many urban legends that have developed around this strange and isolated kloof. Only two footpaths were used to enter the valley from the north. One was through the Gamka River kloof whilst the other was over the top of the mountain. The self named "Kloovers" (Canyon Dwellers) on rare occasions, made their way up the river bed to Gatplaas (the previous name of Calitzdorp) to trade their produce. This was a tiring and tough journey and was dependent on low water levels. In the 1960's when the Gamka Poort dam was constructed, it blocked this path off completely for the Kloovers at the narrow point where the wall was built. The other route was a few kilometres further west over a very steep footpath with many switchbacks up an almost vertical cliff. This route was known as Die Leer (The Ladder) and was even too steep for mules to traverse. The kloof has many stories written into its folklore and one of these is that a born and bred Kloover, Gustav Nefdt, once lugged a Dover coal stove strapped to his back from Prince Albert to the kloof via Die Leer - a feat of extraordinary strength and endurance. The engineer, Louis Terblance, who designed the road lamented that he was saddened that this was the only road he had designed, which had brought about the destruction, rather than the upliftment, of a once thriving community.
" As we approached the huts, a shaggy giant in goatskins appeared and spoke to us in strange outlandish Dutch. He was a white man named Cordier, who lived in this valley with his wife and a brood of half-wild children in complete isolation of the outside world....... We were received with uncouth, but sincere hospitality and applied ourselves to the goats meat, milk, and wild honey that was placed before us.....He told us that no British forces had ever penetrated the valley and that we were the first Boers to do so"
Today at the Swartberg Nature Reserve, Fonteinplaas or Boplaas, you can hire a meticulously restored cottage and savour the dark starry nights, and tranquil days. The kloovers used to call the Boplaas farm, Die Hel, which is located in a separate side kloof of the Gamkaskloof. It happens to be the place where the footpath known as Die Leer, reaches the valley floor. 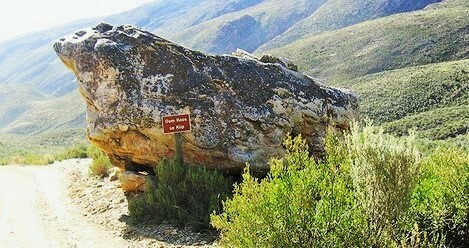 This footpath can still be walked today and is an officially recongnized trail of the Swartberg Nature Reserve. Early visitors were enchanted with the wild sounding name of Die Hel, and soon began calling the entire valley by that name, much to the chagrin of the kloovers. In 1959 requests were received for a road to be built into the valley. Plans were also being discussed at that time to build a dam across the Gamka River. The administrator of the Cape, Dr Otto du Plessis, decided to go and have a look for himself. In the company of several journalists, they scrambled down the Gamka gorge on horseback. The District Roads engineer, Louis Terblanche and other officials from Prince Albert took the top route over Die Leer. It was determined that a road through the poort was not possible. 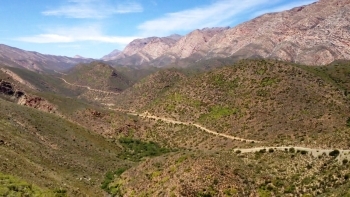 Some weeks later, Terblanche and roads inspector Van Rensburg hiked from the forestry road on the Swartberg Pass to Die Hel and investigated a possible route. Provincial Treasury made a sum of R30,000 available to build the road. The pass was built using an HD11 Allis Chambers bulldozer with a foreman (Koos Van Zyl) and just 12 labourers. It took them from March 1960 to August 1962 to complete the 37 km road. Amongst the many mammals you will more than likely see are Klipsprigers and Grey Rhebuck. Nocturnal animals include the Porcupine, Rooikat and Cape Leopard. There are interesting places to see in the kloof, including several historic houses, a school, a cemetry, and an old Norse watermill. Note that no quad bikes are allowed, but touring motorcycles are allowed. If you love serenity, absolute quiet and brilliantly starry nights in a faraway place, blissfully cut off from cellphones and civilization, then this is the adventure for you.